During WWII the BBC was actively engaged in fostering opposition to the German occupation throughout Europe. This column uses data on variations in radio signal strength during the war to analyse the role played by the BBC’s “Radio Londra” programme in civilian and partisan resistance against the Nazi-fascist regime. The findings suggest that BBC radio played a significant role in coordinating resistance activities against foreign occupation, but only a minor role in mobilising the civilian population against the fascist regime. New media technologies are often perceived as tools to undermine authoritarian regimes, as they might be less subject to political capture than traditional ones.A recent literature has shown how social media (Enikolopov et al. 2016, Acemoglu et al. 2018) and mobile phones (Manacorda and Tesei 2016) may be effective in catalysing political protest in weakly institutionalised environments. At the same time,autocratic regimes may endogenously choose whether to respond to the presence, and potential threat, of media by censoring them or by turning them into surveillance tools (Qin et al. 2017). Hence, the observed effect of media on protest activities is jointly determined by their interaction with the demand for regime change and with the endogenous response of autocratic regimes (e.g. their counter-propaganda). Importantly, such interactions may be particularly relevant when human lives are at stake (e.g. during wars or foreign military occupations). In a recent paper (Gagliarducci et al. 2018), we investigate these issues by analysing the role played by the Italian program of the BBC, “Radio Londra”, in the intensity of the civilian and partisan resistance against the Nazi-fascist regime during a critical juncture of Italian history: the last phase of WWII (1943-1945).We also account for the endogenous response of the Nazi-fascists by looking at the official radio of the fascist regime (EIAR). During WWII the BBC was actively engaged in fostering opposition to the German occupation throughout Europe.To this end, it adopted a twofold strategy. First, the BBC targeted individuals and organisations that were already inclined to undertake an active resistance against Nazi-fascist regimes. Second, it supplied information and counter-propaganda to broader segments of the population. With more than four hours of daily broadcasting, the Italian service “Radio Londra”became one of the main ‘overseas’ programmes of the BBC. While it is clearly difficult to give a precise estimate of the number of people that listened to and trusted the BBC in Italy at that time, historians suggest that it enjoyed a relatively high level of credibility and a large audience among the Italian population (Holt and Van de Velde1960, Briggs1970, Papa1978, Piccialuti-Caprioli1979). We use the Voice of America Coverage Analysis Program(VOACAP) to simulate the strength of the BBC signal across Italian municipalities for each month from the beginning of the Nazi-fascist occupation of the centre-north of Italy (October 1943) up to the German surrender (May 1945). Unlike other radios located in Italian territory,theBBC broadcasted from the UK towards Italy (and continental Europe) by relying on the ionospheric propagation of high-frequency waves. 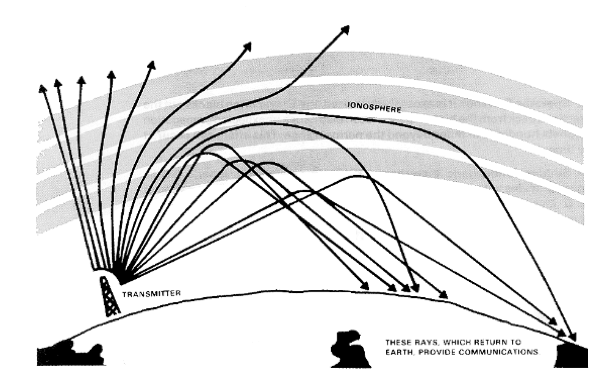 Thanks to this type of radio signal propagation, the BBC signal was able to reach distant places, as exemplified by Figure 1. The ionospheric propagation of high-frequency radio signals is affected by solar activity in the form of sunspots. This feature allows us to rely on a novel identification strategy that, after controlling for municipal and date fixed effects, exploits the residual within-municipality random variation in the BBC signal over time induced by changes in sunspot activities. Indeed, different municipalities in Italy were affected differently by monthly variations in sunspot activity, depending on the location of BBC transmitters, which did not change throughout this period. Figure 2 illustrates the within-municipality variation in the predicted BBC signal between April 1945 and April 1944, which were characterised, respectively, by high and low levels of sunspot activity. 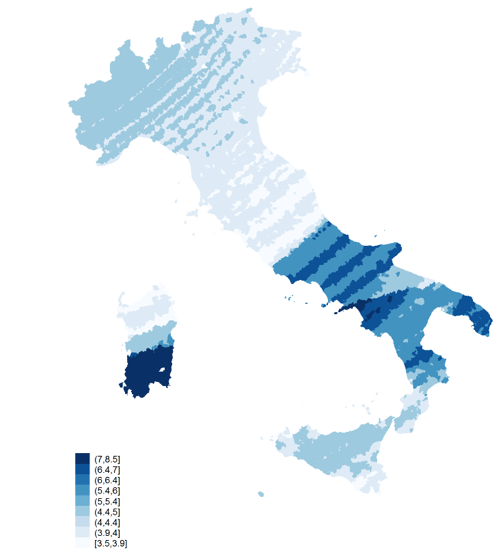 We study the effect of predicted monthly changes in the BBC signal strength on indicators of insurgency against the Nazi-fascist regime in different Italian municipalities. As historical records do not provide a direct (time-varying) measure of the intensity of resistance across Italian municipalities, we use as an indirect proxy the number of episodes of violence perpetrated by the Nazi-fascists in response to partisan or civilian resistance (e.g. Nazi-fascist retaliations). Data are provided by the Atlas of Nazi-Fascist Massacres (a complete census of violent episodes perpetrated by the Nazi-fascists in Italy). Our estimates suggest that a 10% increase in the BBC’s signal strength (corresponding to almost one standard deviation) increased the number of episodes of Nazi-fascist violence related to partisan and civilian resistance by more than 2.5 times, relative to the monthly average. This large effect may be related to the scope of BBC broadcasting. Besides providing counter-propaganda targeted to the Italian population, the BBC also delivered to partisans encrypted messages (e.g. “the hen laid an egg”) containing tactical and logistic information on the timing and locations of air-drops, on bombings by the Allied Air Forces, and on the movements of the Nazi-fascist and Allied ground troops. A change in the BBC signal quality could, therefore, determine whether or not partisan brigades would receive such key information and be able to undertake resistance activities. Additional evidence suggests that BBC broadcasting affected the intensity of partisan activities mainly through improved coordination. First, the intensity of resistance in a given month is affected only by the contemporaneous strength of the radio signal and not by the quality of the signal in previous months. The lack of a long-lasting effect of past BBC broadcasts suggests that the main mechanism at work is coordination of the Allied and resistance groups’ military activities rather than propaganda or persuasion. This interpretation is confirmed by the finding that the competing fascist radio EIAR and the Allied Forces radio (broadcasting from liberated cities in the south of Italy and mainly aimed at propaganda) had no observable effects. Moreover, we find that the effect of the BBC is stronger during the Allied Forces bombing. This once again demonstrates the complementarities between the BBC broadcast and the Allied forces' military effort. Furthermore, we could not find any correlation between the cumulative BBC signal strength between 1943 and 1945 and the outcomes of the first three post-war elections (held in 1946, 1948 and 1953). Putting all these pieces of evidence together, we infer that BBC radio played a significant role in coordinating resistance activities against foreign occupation, but probably had a minor role in mobilising the civilian population against the fascist regime. Italian partisan brigades often enjoyed the support of the local civilian population, but they operated under cover and little direction from their national leaders. In these circumstances, organisational and coordination challenges were of paramount importance, and external directions and assistance through the radio or other media could significantly increase the effectiveness of resistance activities. The BBC fulfilled this role, by providing information about military targets and the movement of enemy troops and also by letting the insurgents know that they were not alone and that their acts of insurgency were deemed strategically important by the Allies. Historical evidence suggests that our findings are unlikely to be specific to Italy. As pointed out by Andre Philip, who had escaped from France to take part in de Gaulle's government, “If there is resistance in France, it is due to the BBC" (Briggs 1970: 7). More generally, this historical evidence reinforces the idea that media can play a key role in facilitating and coordinating acts of insurgency against a military regime. Acemoglu, D, T A Hassan and A Tahoun (2018), “The Power of the Street: Evidence from Egypts Arab Spring”, Review of Financial Studies 31(1): 1-42. Briggs, A (1970), The war of words: The history of broadcasting in the United Kingdom, Vol. III. Oxford University Press. Enikolopov, R, A Makarin and M Petrova (2016), “Social Media and Protest Participation: Evidence from Russia”, CEPR Discussion Paper 11254. Gagliarducci, S, M Onorato, F Sobbrio and G Tabellini (2018), “War of the Waves: Radio and Resistance During World War II”, CEPR Discussion Paper 12746. Holt, R T and R W Van de Velde (1960), Strategic Psychological Operations and American Foreign Policy, University of Chicago Press. Manacorda, M and A Tesei (2016), “LiberationTechnology: Mobile Phones and Political Mobilization in Africa”, CEPR Discussion Paper 11278. Papa, A (1978), Storia Politica delle Radio in Italia: Dalla Guerra d'Etiopia al Crollo del Fascismo, 1935-1943, Guida editore. Piccialuti-Caprioli, M (1976), Radio Londra 1940-1945: Inventario delle Trasmissioni per l'Italia, Ministero per i beni culturali ed ambientali. Piccialuti-Caprioli, M (1979), Radio Londra, 1939-1945, Laterza. Qin, B, D Strömberg and Y Wu (2017), “Why Does China Allow Freer Social Media? Protests Versus Surveillance and Propaganda”, The Journal of Economic Perspectives 31(1): 117–140.